Bobby Bridger is multi-talented man. He is a well-known author of several books - fiction and non-fiction. He is poet, painter and play write. 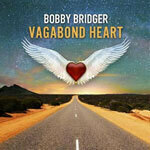 However he started his career as a singer/songwriter and he has returned to this with a new crowd-financed album called Vagabond Heart. Recently, he spoke with Outpost editor Art Young.